Are Horses ‘Naughty’? Or Do They Just Need to Be Better Understood? Horses are often classified as being ‘naughty’ or ‘aggressive’ if they try to bite when saddled; refuse to stand at the mounting block or for the farrier or vet; or are difficult to catch. Our ability to read an animal’s body language is variable. We often miss the whispers and so the animal has to shout to make us listen. The horse that is swinging his head round with bared teeth when the saddle is placed on his back is shouting his discomfort. We have missed his initial signals which may have included tightened lips, feet stamping, pawing, tail swishing, blowing out etc. Naughty or aggressive behaviour can also occur if the horse is unable to move away. 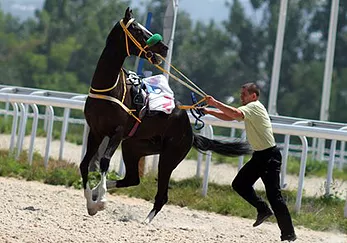 If we prevent a horse from moving his feet when his instinct is to flee, behaviours such as barging, kicking, biting and rearing may be the result. If we continue to miss or ignore these more subtle signals then the horse quickly learns that they are ignored and that overt aggression or avoidance behaviour are the only signals that work. By taking the time to stand back and consider why the horse is displaying a set of behaviours, we can then start to identify the possible causes and emotions driving that behaviour. From that we can devise a plan to change the negative emotion currently associated with our actions, to one which starts to have a positive association for the horse.